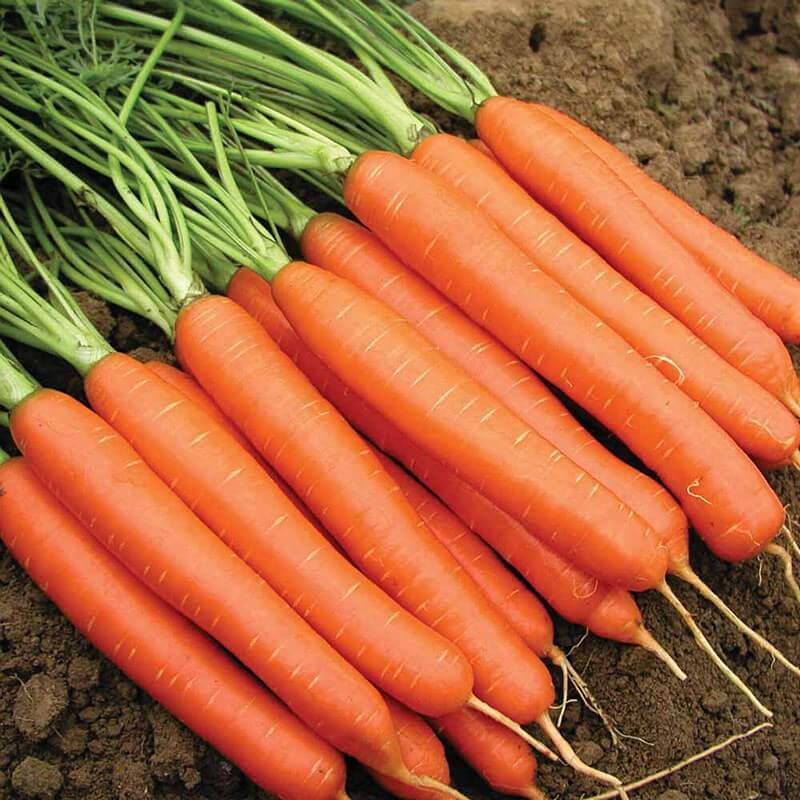 Carrot – Romance F1 is a very popular and most attractive carrot. 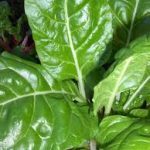 It grows very uniformly and performs well in most soil conditions. Carrot – Romance F1 yields blunt tipped carrots with deep orange roots. Resists cracking and is very sweet tasting. It is an early Nantes type and stores well. 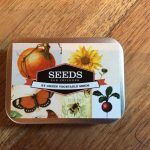 Sow directly outside in a well prepared seed bed in shallow drills (1.5cm deep). The best sowing date is in late May/early June to avoid the carrot root fly. Related to: Parsnip, celery, celeriac, parsley, coriander, dill. Botanical classification: Daucus is the ancient Greek name for carrot. Carota means ‘red rooted’ and sativus means cultivated. Introduction: Carrots derive from the wild carrot which is found throughout Europe and the British Isles. They are biennials, but are grown as annuals. If they are left in the ground they flower the following spring. Carrots are one of the richest sources of Vitamin A in human nutrition. History: Carrots are native of Afghanistan where they were cultivated as early as 500 BC and then in the eastern Mediterranean region. Orange carrots were first developed in Holland in the 17th century. Before then carrots were either yellow, purple or red. The Celts called them ‘honey underground’ due to their sweet flavour. Berlicum – large cylindrical stump rooted carrots. Chantenay – medium broad short stump rooted, conical. Autumn King – very large, long, slightly tapering. Good for storage, high yields, but only fair flavour. Nantes – cylindrical, stump rooted. Used for early crops and forcing. Amsterdam – small, slender, cylindrical, stump shaped root, excellent for forcing in tunnels. Soil and site: Early crops prefer a sheltered spot. Maincrop carrots thrive better on an open site. Carrots do best on light and stone free soil which is free- draining. The ideal soil pH is 5.8-7. However, carrots also do reasonably well on marginal soil, especially the stronger growing types like Chantenay and Autumn King. 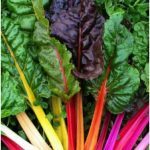 Under no circumstances add fresh manure to the soil before sowing. This will cause too much leafy growth at the expense of root development. The roots would also tend to fork trying to find the pockets of manure, rather than growing down. Forking of the roots also occurs if there are stones in the ground. Well-rotted compost is best incorporated into the soil in the autumn and the soil should then be covered with black plastic over the winter to prevent leaching of nutrients. Rotation: Carrots should be grown in the Umbellifer section of the rotation. It is essential that carrots are being rotated. Plant Care: Carrots should be kept well weeded at all times because they are bad competitors against weeds. Harvesting: Early carrots can be pulled young and bunched as required with their leaves attached. Maincrop carrots should be harvested in autumn before a heavy frost. On lighter soils they can be pulled by hand and the tops twisted or cut off. On heavier soil it is recommended to fork the roots out as they may otherwise break. In milder areas with very free draining soil one could consider leaving the carrots in the ground over winter and harvest as required because flavour is best when harvested fresh. In wetter parts the roots may rot. Storing: Carrots are ideally stored in a root cellar or another well-insulated building in a box of moist sand. The temperature should be close to 0 C, but not freezing. Before storage, grading is essential. Any roots with carrot fly damage or diseases should not be stored with the healthy ones. If storage conditions are ideal one can expect a storage life of about 5 months. Traditionally carrots were stored in clamps which can be made outside or under shelter. The carrots are piled up on a base of straw in a heap not more than 60cm high, then covered with a thick layer of straw and then a layer of earth (15cm thick). Unfortunately the wastage is generally quite high as mouse and rat control is difficult. 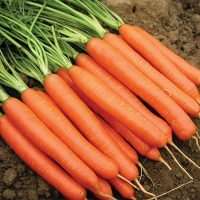 Carrots which are sown in the first week in June generally avoid the first attack of the flies. Many gardeners claim that intercropping carrots and onions, discourages carrot fly and onion fly respectively, by masking the scent of the vegetables. I have frequently tried this, but always very unsuccessfully. The carrot flies are attracted by the scent of the carrots, which is released when the carrots are thinned and weeded. Thus thin sowing to avoid thinning and the use of the stale seedbed technique to reduce weeding frequency are good ways to reduce the problem. I would also recommend to do the necessary weeding and thinning all at once (hopefully with some friends), so it will be quickly done. Carrot fly can only hop around, thus a barrier about 60cm high of fine mesh and buried in the ground about 5cm around the carrot plot successfully keeps the fly at bay. Unfortunately, it didn’t work for me either. The flies must have blown over the barrier. The most successful control method is to cover the carrots with a crop cover such as bionet which is specially designed to keep out carrot root fly. Maincrop carrots should all be harvested at the same time, because during harvest the carrot flies are attracted in large numbers because of the smell. I always found if harvesting stretches over a few weeks the last ones are particularly infested with the maggots. Ensure that all roots are harvested and trimmed leaves and infected carrots are taken away from the field and properly composted. Alternatively infected roots can be burned. There are some varieties of carrots with some tolerance to carrot flies (Sytan, Resistafly and Fly Away). I was very disappointed with them. They still got the root fly and they also tasted quite soapy. How much to grow? You may eat 6 reasonable sized carrots per week. Carrots will store safely in boxes of sand in a shed from October until the end of April which is 28 weeks. 28 weeks multiplied by 6 carrots per week makes a total of 168 carrots. If your spacing is 4cm in the row you get 4 rows in a bed (bed width: 1.2m) you will get 100 carrots per meter of your bed. In 2 meters you will get enough carrots from October to April. Nairobi F1: early maincrop Nantes type with exceptionally high yields of uniform roots. Narbonne F1: maincrop Nantes type with good resistance to splitting.